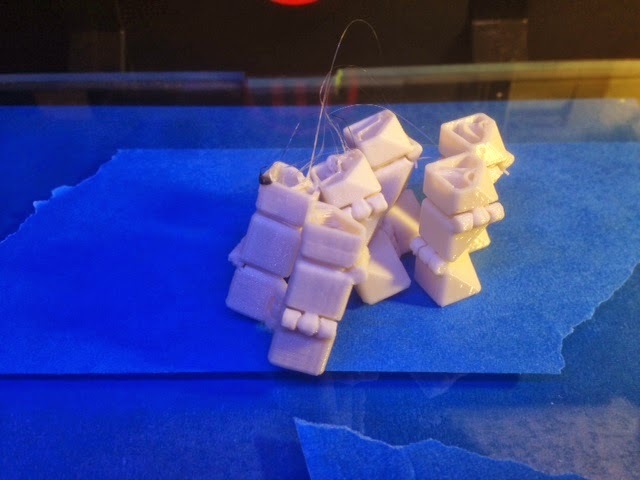 Here's my favorite fail from this week: a botched print of three Fidget Cubes. It's partially my favorite because I happened to have been sitting right next to the machine when it happened so I could stop it right away before the dreaded "giant blob built up around nozzle" problem kicked in. Anyway, long story short, now I'm using Glass-with-tape-and-raft for my prints, and I'm getting a lot fewer "blob" errors. And even better, figuring out this fail helped me to figure out another. On Day 208 I started printing out a great many 26mm Level 3 Menger cubes. (Side note to @standupmaths - I actually put the package in the mail today, can you believe that? Two months earlier than usual.) Lots of the prints were turning out like Day 207's free-floating half-Menger-attached-to-blob, and no amount of re-leveling the build platform, installing fresh blue tape, or "just trying one more time to see if the problem would magically stop" was fixing the problem. Until we tried printing with a raft - not because the raft made it stick better, but because it turned out that for this model the raft was really really small and didn't cover the base; see the left object in the picture below (shown upside-down so you can see the tiny raft). Mystery solved! The raft thinks that the first layer of the model is really small. 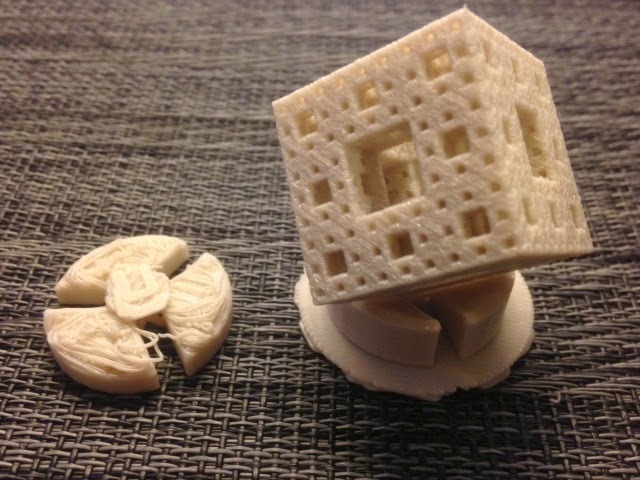 Which means that a tiny dot in the center of the model must be too low: at least for very small sizes like this 26mm cube, a little piece of the bottom center corner of owens' Customizable Menger Sponge sticks down too far and needs to be sliced off. As you can see from the model on the right in the picture above, this change worked; the raft now covers the entire stand and we got a very sturdy print. Thank you once again, failure, for pointing us in the right direction!